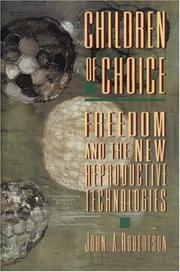  Rigorous study of the constitutional right to choose reproductive technology, by law professor/legal bioethicist Robertson (Univ. of Texas, Austin). For the author of The Rights of the Critically Ill (not reviewed), procreative liberty--the freedom to decide whether or not to have children, and whether or not to rear them--is a fundamental right of all individuals, fertile or infertile. Therefore, he argues, individuals should be free to choose reproductive technologies such as in vitro fertilization and the morning-after pill without government interference, unless the state can demonstrate a compelling interest in regulating such a choice. It seldom can, he claims. For example, the government may justifiably mandate that a severely retarded girl use the long-term contraceptive Norplant to protect her from sexual abuse in an institutional setting, but it may not make Norplant compulsory for HIV-positive individuals or convicted child abusers. Robertson contends that a ``basic commitment to procreative liberty'' entails respecting a couple's advance agreement to freeze or discard embryos, to enforce surrogacy contracts (even if the gestating mother later changes her mind), and (probably) to genetically ``enhance'' embryos. He analyzes the constitutional implications of each technology with a law professor's penchant for outlines and obfuscation (e.g., ``Objections to paying surrogates are often more deontological than consequentialist''), but with a firm sense of the wrenching real-world questions left unanswered and the specific ways people can protect their reproductive rights. For instance, he urges that lesbian couples seeking children through artificial insemination ``have one partner provide the egg for the embryo which is then gestated by the other partner.'' A searching exploration of the ever-expanding parameters of ``choice'' written with Solomon-like sagacity. General readers will certainly be challenged, but this is not a law book for lawyers only.